The Montanhas - the Mountainous region of Portugal - is the whole of the northeast as far as the frontier with Spain, in the north, and as far as the river Tagus, in the south. By Air There are aerodromes in Braganca, Chaves, Mirandela, Vila Real, Viseu, Covilha and Monfortinho. By Rail Portuguese Railways maintains connections between this area and the principal places in the rest of the country. There is an interesting 1 19th-century steam train which still runs and is maintained as a tourist attraction. By Road This area is crossed centrally by the IP2, which connects Vilar Formoso, on the eastern frontier, with the Atlantic Ocean, on the west. This thoroughfare is crossed north to south by the IPS, which runs through Guarda and Castelo Branco, as does the IP4 linking Braganca to the Douro river. The average temperatures in this region are about 14�C/57�F in winter and about 26�C/78�F during the summer months. The Montanhas from the north to the central part of Portugal contrast with extensive plateaus and deep valleys offering views of fantastic beauty. Here, granite is prevailing, for there are many monuments, churches and houses built of this noble stone. The Alto Tamega area is famous for its spas, mostly situated in lovely parks and served by romantic hotels. Among others are Carvalhelhos, Chaves, Pedras Salgadas, and Vidago. Further south, near Viseu, it is said that the first king of Portugal used to come here to drink the waters of Sao Pedro do Sul to cure his old-age ailments. It is on the banks of the Douro river, lined with terraces of extensive vineyards, that there is a special microclimate allowing the production of the world famous port wine. The river is navigable as far as the Spanish frontier, and boat trips are a perfect way of viewing the marvellous scenery.The Montanhas is an area enormously rich in culture. Here there are traces revealing its pre-. historic past, the Roman occupation and the medieval times. Granite is omnipresent in this region, used almost always in the monuments, from the Domus Municipalis in Braganca, the only example of civil Romanesque architecture in Portugal, to the imposing Viseu and Guarda Cathedrals or the Santa Maria das Junias Cistercian Monastery. From the Baroque period, two monuments stand out: the Mateus Palace, drawn by the Italian architect Nasoni and which stands near the pretty town of Vila Real, and the Nossa Senhora dos Remedies Sanctuary in Lamego. In this area, extremely important in historical legacies, one may admire the rich treasures in the Abade de Basal Museum in Braganca, a rich collection of Portuguese painting in the Grao Vasco Museum in Viseu, the collection of exhibits in the Tavares Proenca Junior Museum in Castelo Branco, and also a precious collection of 16th-century tapestry in the Lamego Museum. Crossed by several mountain chains, the central part of the region comprises the Serra da Estrela Natural Park, where you will find the highest peak in continental Portugal, reaching an altitude of 2000 m. This is the centre for winter sports in the country and the ski resort is open from December to March. In summer, the area is equally popular for the excellent conditions it has for fishing and mountaineering. Apart from the Serra da Estrela, there are many other natural parks in the area, such as Montesinho on the northern frontier, Alvao Park near Vila Real and the Natural Reserve in the Serra da Malcata. The whole of the eastern region of Montanhas, on the frontier with Spain, has excellent facilities for riding and hunting, including twelve zones reserved to hunt and shoot. There are many dams, lakes and water courses offering a variety of water sports. There is a golf course in Vidago. A variety of cultural events takes place in the Mateus Palace, such as music festivals and literary meetings. During the summer, colourful local festivities and fairs take place in the area, giving a new life to legends and habits which have deep roots in the past. The variety of gastronomy in the Montanhas region includes such tasty dishes as bean stews, special sausages, such as "alheiras" from Mirandela, ham from Chaves and the very much sought-after Serra cheese. The wines are of equal importance, and worthy of mention are Dao, Lafoes, the Douro reds and whites, and of course the port, while not forgetting the rose. Local art is beautifully expressed in the hand embroidered silk bedspreads from Castelo Branco, black pottery, copper and wrought iron handicrafts. Vila Real is a town famed for its quantity of manor houses. One of the best-known and open to the public is the Mateus Palace, a 1 Sth-century Baroque residence surrounded by vineyards, and it is from these grapes that the famous Mateus rose wine is produced. Important cultural events take place in the palace throughout the year. In the Alvao Park, rich in flora species, and in the Serra do Marao, visitors can take advantage of the excellent natural facilities for mountaineering and walking. Vidago and Pedras Salgadas are enchanting spa resorts surrounded by woods and offering good accommodation in romantic hotels. Vidago has the most northerly golf course in Portugal. It has only nine holes, but the layout is very challenging. Further north, Chaves was known in Roman times as Aquae Flaviae owing to the medicinal properties of its waters which spout at a temperature of 73�C. 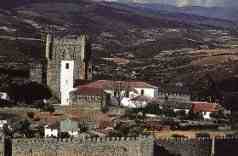 Chaves is situated at the end of a long valley, and one has access to it by a Roman bridge over the river Tamega. The enchanting ancient town is dominated by an old tower. The original houses have colourful varandas and painted wooden windows, while its churches, such as Santa Maria Maior and Madalena, are in the Romanesque style with Baroque wood carvings. Boat trips departing from Oporto or other boat stations on the river bank can be tailor-made to suit the individual, lasting from one hour to more than a day. Apart from a unique landscape, there are many places on the river banks which are memorials of the history of Portugal. The whole Douro area is one magnificent landscape, with the mountains always in the background. There are Roman bridges, small chapels and churches of pure Romanesque or Baroque styles scattered amongst the vineyards producing the port wine, so appreciated throughout the world. The sun warms the ground and the people of this region, always so hospitable and willing to share their noblest traditions. There are many manor houses on the banks of the Douro, surrounded by famous estates, where you can have lunch or organize meetings. These noble estates are part of a rich heritage, carefully preserved, of churches, "pelourinhos" (decorative stone columns set in public squares) country houses or small palaces, which bear testimony to the history of the rich and influential aristocracy existing in the region since the Middle Ages. In Sabrosa, you will find the house where Fernao de Magalhaes was born the first navigator to sail round the world. Viewed from the top of belvederes, the mountains and river are bathed in a golden silence, enough to make you catch your breath. Seventeenth-century glazed tiles and gilded wood carvings in the many Baroque churches along the banks of the Douro make an extraordinary combination with the famous wine to add to the extreme beauty of the region. Sao Pedro do Sul is another spa town in the Montanhas region, situated in the luxuriant Vouga valley, with its peaceful, salutary atmosphere. Viseu has a vast amount of monumental heritage, of which mention should be made of the Grao Vasco Museum, with an important collection of paintings from the 16th-century Portuguese school, and an imposing cathedral. There are many traditional events taking place throughout the year, and one of the most important is the Sao Mateus fair, held annually in September. Lamego is a museum city in the heart of the Douro valley, best-known for its Baroque monuments - fountains, statues and the monumental staircase leading to the Nossa Senhora dos Remedies Sanctuary. Worth visiting also is the local museum, with an important collection of sacred art and Flemish tapestries from the 16th century. Montanhas is the region with the largest number of pousadas, two of them in historic areas, but all superbly situated in landscape terms, with typical features of the region. There are also five 4-star hotels and thirty-three manor houses (Casas de Turismo de Habitacao) offering accommodation. Some of them are situated in the old country estates which line the banks of the Douro. Some of the estates along the douro are the most prestigious in the area, and facilities for meetings and incentives are available at the Palace Hotel, in Vidago, and the Mateus Palace, in Vila Real.